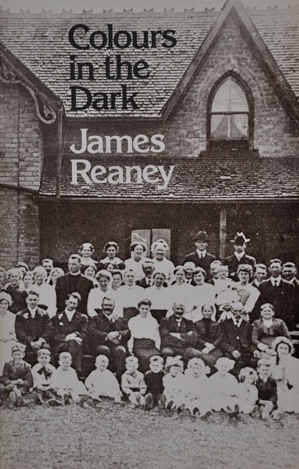 In Act II of James Reaney’s play Colours in the Dark, two boys visit the mysterious Mr. Winemeyer, a sculptor hermit. 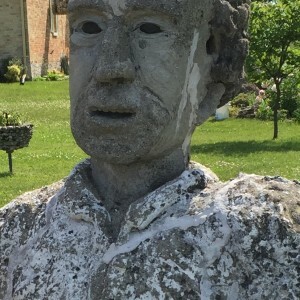 George Laithwaite (1871-1956), a farmer near Goderich, Ontario, created cement sculptures around his farm and is the inspiration for the character Mr. Winemeyer. Here is an excerpt from Act II, Scenes 3 and 4, where the two boys visit the old hermit, Mr. Winemeyer, and see his sculptures. BOY 1: Where’d you get the peacock feather, Mr. Winemeyer? HERMIT: Had a pet peacock once when I was a boy. A big old sow we had had a peeve about it – and one day caught it in the orchard and devoured it. This – was all that was left of my beautiful bird. Sticking out of that beast’s mouth. BOY 1: holding the feather And nothing else has happened to you lately? HERMIT: Well – yes – this happened. I happened to be out in the yard scraping out my frying pan when coming down through the air I saw – a falling star. It does. It is yellow. BOY 2: What are you going to do with this falling star, Mr. Winemeyer? SCREEN: Actual slides of the Goderich, Ontario, primitive sculptor Laithwaite – his cement figures. 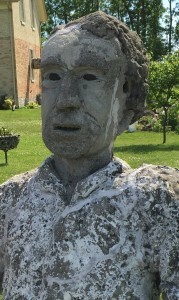 HERMIT: Come out with me to the orchard and see my latest cement sculptures. On cue, the sculpture slides appear. They could also be mimed by the Company. Now here’s Sir John A. at the plow! Here’s Snow White and the Seven Dwarfs. That’s the only film I’ve ever seen and the only one I’ll ever see. You can’t go any higher than that in film art. HERMIT: That’s the infant Riel suckled by the buffalo Manitoba. BOY 1: What’s this one doing, Mr. Winemeyer? HERMIT: I finished that last April — that’s Mackenzie King cultivating the rows of compromise. Now – here is where I’m using this falling star. Here’s Good – in a terrible combat with his brother Evil – over – this. 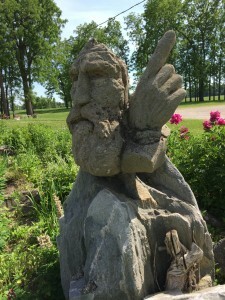 He places the star between the statue-actor’s hands. The star has now become a lump of rock. BOY 2: Could I have a piece of that star? HERMIT: Why sure. These two projecting knobs will never be missed. Both have a piece. BOYS: Gee, thank you, Mr. Winemeyer. We hear music. The Windlady appears with her Rain Doll. 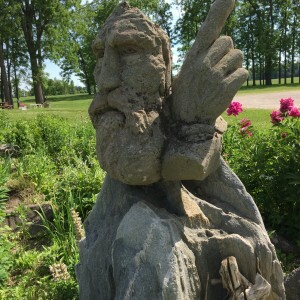 HERMIT: Now there’s a good subject for a piece of sculpture. HERMIT: The Wind and the Rain. 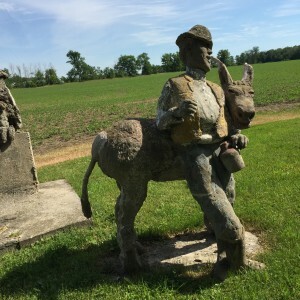 BOY 2: Mr. Winemeyer – was the pig your brother? Were you the peacock? Mr. Winemeyer shakes his head. SCREEN: Centre panel shows a large star. ♦ For more about James Reaney’s imaginative use of George Laithwaite’s sculptures, see James Stewart Reaney’s article, Concrete sculptures still ‘play’ well. ♦ For a delightful tour of George Laithwaite’s sculptures (summer and winter! ), see Harrison Engle’s film “Legacy” (1960? ), which features commentary by Laithwaite’s family and J.H. Neill, then Curator of the Huron County Pioneer Museum. 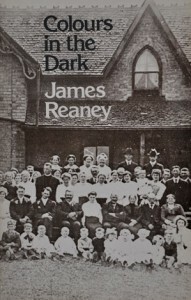 Colours in the Dark by James Reaney is available from Talonbooks. Goderich, Ontario — Sir John A. Macdonald sculpture by George Laithwaite.